Watch the incredible first trailer for Jurassic World: Fallen Kingdom. 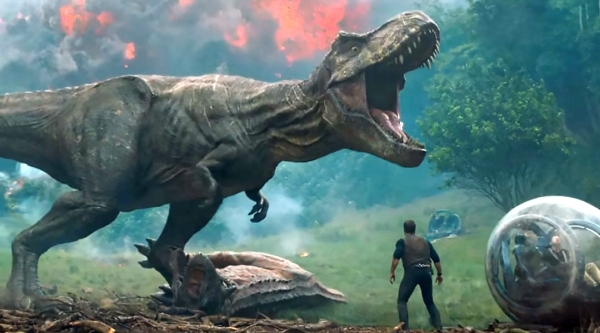 The first trailer for the Jurassic World sequel is here and it's stunning. “Jurassic World: Fallen Kingdom” is the sequel to “Jurassic World,” Colin Trevorrow’s 2015 soft reboot of the “Jurassic Park” franchise. Chris Pratt and Bryce Dallas Howard reprise their roles as Owen and Claire. Jeff Goldblum returns as Ian Malcolm from the original film saying "These creatures were here before us. And if we’re not careful, they’re gonna be here after us." The island of Isla Nublar is going to explode and the group is on a mission to save the dinosaurs. We get to see Jeff Goldblum and see whatever happened to Blue the trained raptor. While we don't know everything about the film there's one thing we know. There's a lot of running from dinosaurs. If you think this trailer is spoiling anything you're wrong. Director Colin Trevorrow says on Twitter "everything in the trailer is from the first 57 minutes". Expect a lot more surprises on the way. Official Synopsis: "It’s been four years since theme park and luxury resort Jurassic World was destroyed by dinosaurs out of containment. Isla Nublar now sits abandoned by humans while the surviving dinosaurs fend for themselves in the jungles. When the island’s dormant volcano begins roaring to life, Owen (Chris Pratt) and Claire (Bryce Dallas Howard) mount a campaign to rescue the remaining dinosaurs from this extinction-level event. Owen is driven to find Blue, his lead raptor who’s still missing in the wild, and Claire has grown a respect for these creatures she now makes her mission. Arriving on the unstable island as lava begins raining down, their expedition uncovers a conspiracy that could return our entire planet to a perilous order not seen since prehistoric times. With all of the wonder, adventure and thrills synonymous with one of the most popular and successful series in cinema history, this all-new motion-picture event sees the return of favorite characters and dinosaurs—along with new breeds more awe-inspiring and terrifying than ever before. Welcome to Jurassic World: Fallen Kingdom." Jurassic World: Fallen Kingdom opens June 22, 2018, in the U.S.